The proscription and declaration of the Indigenous People Of Biafra, IPOB, as a terrorist organisation is illegal, President of the Senate, Bukola Saraki, has said, opposing the South-eastern governors and the country's Armed Forces. Mr. Saraki spoke on Monday in a statement he shared on Facebook and Twitter. 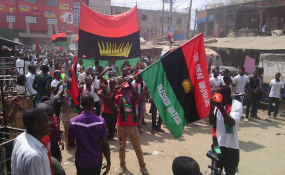 Last Friday, the governors of the five South-eastern states had announced proscription of all IPOB activities, moments after the military declared the separatist group a terrorist organisation. But Mr. Saraki said the two moves did not follow due process and were made in violation of law. "I also wish to state that the announcement of the proscription of the group known as Indigenous People of Biafra (IPOB) by Governors of the South-east states and the categorisation of the group as a 'terrorist organisation' by the Nigerian military are unconstitutional and does not follow due process," said the Senate President. "Our laws make clear provisions for taking such actions and without the due process being followed, such declaration cannot have effect. "I am sure the President will do the needful by initiating the right process. This will go a long way in demonstrating to the world at large that we are a country that operate by laid down process underevery circumstance. So, those who have been hammering on this point should maintain their cool. National Assembly will investigate crisis in South-east." He, however, praised the military for efforts at maintaining peace, but warned against human rights violations, even in the face provocation. 5. I also wish to state that the announcement of the proscription of the group known as Indigenous People of Biafra (IPOB) by Governors of the South-east states and the categorization of the group as a 'terrorist organisation' by the Nigerian military are unconstitutional and does not follow due process. Our laws make clear provisions for taking such actions and without the due process being followed, such declaration cannot have effect. I am sure the President will do the needful by initiating the right process. This will go a long way in demonstrating to the world at large that we are a country that operate by laid down process under every circumstance. So, those who have been hammering on this point should maintain their cool. 7. Also, it is my view that we should not over-stretch the military. We need to protect our military against dissipation of their fighting strength. And this means we need to strengthen the police and equip them with the capacity to deal with civil crisis. That is why we, in the National Assembly, are already reviewing the Police Act and also looking at the possibility of enabling other para-military agencies to help in curbing civil unrest and maintenance of law and order. 10. Let me further reiterate the need for all leaders of thought -political. religious and traditional- to continue to engage with our people on the need to maintain peace and be our brothers' keepers.